Springfield, MA, April 16th, 2019. Free. Do you need fresh ideas to help you strategize about the next steps? 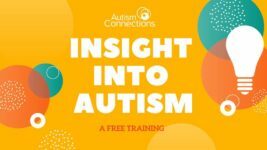 This training discusses the strengths and challenges people with autism often experience. Topics in the training include diagnostic criteria, receptive and expressive communication skills, social competencies, sensory challenges and common behavioral challenges. * Attendees will learn practical strategies to facilitate the growth and development. * You will find benefits from this training if you are a parent or educator, caregiver or professional providing services to children, teens, or adults.